They called him "Walkin' Talkin'" Charlie Aldrich. He was a native of Ogawam, Oklahoma, a suburb about 25 miles from Bradley, Oklahoma. He came by that nickname rather naturally, felt everyone was his neighbor and was constantly 'walkin' and talkin' with anyone he'd meet. He was six foot two, smiling blue-green eyed, light brown haired and was talented as an emcee, guitarist, vocalist, songwriter and known for his sincertiy towards the public. Charlie worked hard to get his first guitar. He got it by milking enough cows on his mother's farm during the 1932 depression to buy a $3.98 guitar. His mother was his first teacher. And hard work and music stayed with him during those early years growing up. Later, he'd pick cotton all day long for 15 cents and then drive 30 miles to a country theater to see a Gene Autry movie, his first inspiration. Around 1946, Charlie got his honorable discharge from the Navy. From there he went to work as an assistant salesman for a dry goods chain store, where he got promoted quickly to head salesman. For about three years, Charlie had a band in Oklahoma and broadcasted over the CBS network with a show called "Oklahoma Roundup". 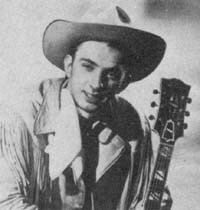 Then, he went out west to California where he started working with Spade Cooley, the western swing king. Then, he became part of Cliffie Stone's Hometown Jamboree group that broadcast over KXLA and KLAC-TV out of El Monte, California. He also worked with T. Texas Tyler and Tony Martin a various points at that time, too. But along came 1951 and his popularity soared. He came out with a tune called "Walkin' The Guitar Strings" and it became his curtain call. That got him his own show on KTTV and was said to be getting over 200,000 pieces of mail a year. His songs were being published by the famed Acuff-Rose company and also the Tannen Music Company. He had three radio programs, five days a week on top of his daily television show. And if that didn't keep him busy enough, he owned and operated a music studio in Burbank, California. If he had any time left, he did personal appearances. He had a horse that may have been part of his personal appearances. It was called Ranger and was said to be a hit with the kids. Ranger could do 45 various types of stunts. And had had a quarter million kids climb on his back during a two year period. And he kept adding to his musical skills while he was in California. He got a degree for classical guitar music form the Los Angeles Conservatory of Music.